"Axon' [ak-son] (noun) - the long thread-like part of a nerve cell along which impulses are conducted from the cell body to other cells. Compare with dendrite." In the I love bees saga, Axons were the Operator's way of communicating. She did this via audio clip files that had to be "unlocked" by "crew members" of the Apocalypso. These files, which together form an audio drama, can be listened to at the I Love Bees Axon Clips. Players wait at an axon. On August 10 2004 a new white-text-in-black-box message appeared on the site's links.html page, containing the enigmatic and inscrutable phrase "AXONS GO HOT" above the same countdown to August 24 that appeared on the site's main page. Beneath the black box, a two-column portrayed table containing 220 pairs of numbers that were eventually found out to be factual GPS coordinates to a given, known place. GPS coordinates for actual pay phones spread across the United States of America. 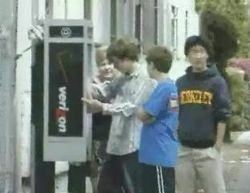 The out-of-game (OOG) site payphone-directory.org gave players a list of public phones, many of which included the address. By using another OOG site the, geocode test site returned GPS coordinates that appear to coincide exactly with the coordinates that Melissa has been posting. Melissa used the axons as venues for voice communications to her crew. Each list of axons was divided into groups, and each group had a name like "pqi", "troy", or "beer." Each axon in each group had a unique GPS coordinate, and a corresponding time between 06:07 and 18:06 (PDT). Initially each group was green in color. There was also a status bar next to the group name, indicating the number of axons that Melissa wanted to be connected. At a designated time, a pay phone rang at the address corresponding to the GPS coordinate. When a player picked up the phone, Melissa asked if they were there, and then complained that "damage to your hardware is making it difficult to maintain this voice." Her voice sounded very odd, like a combination of at least two separate female voices with the occasional exclamation of "I love bees!" thrown in for variety. From September 7-14, Melissa asked "What ship are you assigned to?" to which the correct answer was "Apocalypso." From September 14-21, Melissa asked "What is your captain's last name?" to which the correct answer was "Greene." From September 21-28, Melissa asked "What is my favorite game?" to which the correct answer was "Hide and Seek." From September 28-October 5, Melissa asked "What is my favorite song?" to which the correct answer was "Stormy Weather." From October 5-12, Melissa asked "What must we reveal?" to which the correct answer was "The truth." From October 12-19, Melissa asked "Who is the enemy?" to which the correct answer was "The Covenant." From October 19-26, Melissa asked "On what colony was I created?" to which the correct answer was "Reach." From October 26 onwards, Melissa asked "What insect do I hate the most?" to which the correct answer was "Bees." If the player got the answer wrong, Melissa told them that they were not meant to hear this, and instructed them to "purge the contents of your chatter." Then an endless, spooky repetition of "I love bees!" would play until the player hung up the phone. Once Melissa verified that the caller was who she thought they were, she played an audio clip: a small section of the I Love Bees audio drama. The particular clip that played is the same for each axon in any given group. The group name always had something to do with the clip -- for example, someone says "much lifting" in the clip played for an axon in the group named "much_lifting." After the audio clip played, Melissa asked whether she should "repeat or continue?" If the player said "repeat," the audio clip was repeated until the player was brought back to the same question to repeat or continue. If the player said "continue," Melissa stated that the communication equipment that they were using was not allowing her to continue, and the phone call ends with the same "I love bees!" repetition. Each time Melissa made a successful connection, she updated her list of axons, marking it "CONNECTED" and "AXON HOT," and she also incremented the status bar. When enough axons were activated in a group -- that is, when the status bar for that group was full -- the group color changed to orange, and the name of the group became a link to the same audio clip, so everyone could hear it. At the top of each page containing axons was a giant status bar, keeping track of the total number of connected axons and counting down to 777. When they reached that number, live conversations between Melissa and players were triggered. On Nov 4, 2004, all the final axons were unlocked and then available online on the Ilovebees.com webpage. It was then that Melissa returned to her own time. You can read her farewell message.